The must-have neck cream that tightens skin and reverses sun damage. The setting was New York City’s St. Regis hotel. The occasion? A meeting with renowned dermatologist Dr. Macrene Alexiades-Armenakas, who invited us up to experience her transformational neck cream. The silky formula is infused with more than 37 active ingredients—including ferulic acid, resveratrol, and red algae extract—that, when combined, fight dark spots and aging. Alexiades-Armenakas extensively vets every component and tests each on her own skin. 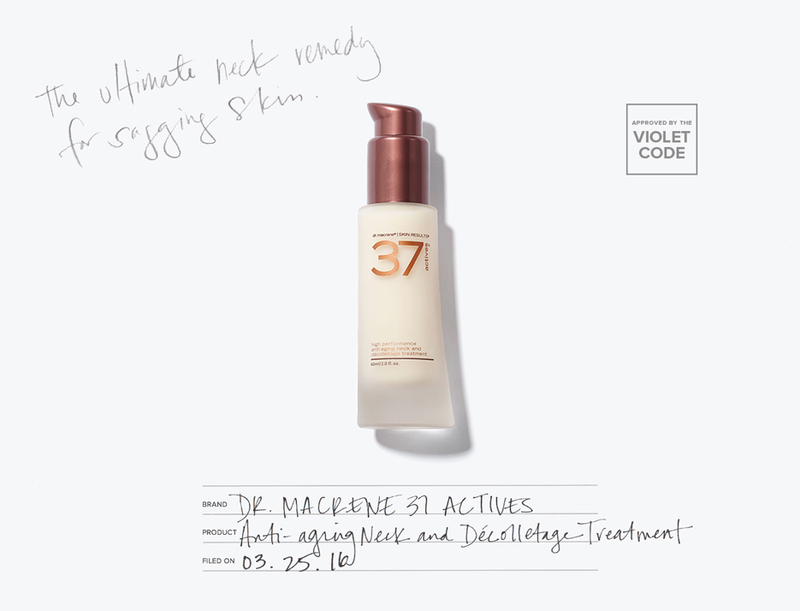 The lucky 37 that made the cut proved to be the safest and most active ingredients available. Within four weeks of testing the cream, VIOLET GREY’s community of beauty experts reported results ranging from a firmer chest to a reduction in sun damage. ON SET: Proven to prime skin for highlighter and ensure a luminous glow for the duration of a 10-hour photo shoot. ON THE RED CARPET: The perfect treatment pre-step and repeat, so that while tabloid reporters may divulge your age, your décolletage never will. ON THE VANITY: Helps to reverse sun damage, ensuring that at age 70 your neck will rival Helen Mirren’s.